and one of the world’s major opera houses, was magnificent with its four rings of balcony seating. The stage curtain was painted in graffiti art over a montage of Spanish tones. Last night’s performance featured two pre-eminent all-stars with mezzo-soprano, Anita Rachvelishvili, in the title role of Carmen; and tenor, Russell Thomas, as Don José. Rachvelishvili has previously performed this role at La Scala; Covent Garden; the Met & with the COC in 2010. Thomas has established an international reputation performing recently at the Met, Covent Garden, and in Berlin, Frankfurt, Chicago and Los Angeles. 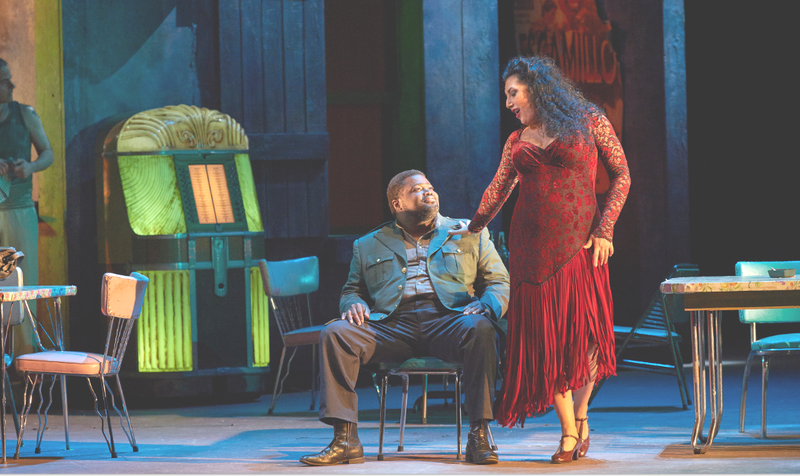 For the most part, ‘Carmen’ is an entertainment piece with familiar music meant to be enjoyed. Conductor Paolo Carignani, provided crisp direction. He wasted no time entering the pit and began the overture while the audience was still clapping. The orchestra itself gave an energetic, yet controlled, accompaniment to the on-stage action. Set Designer, Michael Yeargan, created a mid-20th century Spanish locale for the opera. The first act took place in a market square filled with townsfolk, factory women, children and police in front of the police station. The second act took place in an open-air café with strings of lights overhead and a jukebox in the corner. The final act took place outside the amphitheatre where the bullfight took place. The set was designed so that the entire cast could be seen sitting in the stands of the arena cheering on the spectacle of the bullfight while Carmen and Don Jose played out the climactic moments of their ultimate joint demise centre stage. Director, Joel Ivany, effectively heightened the energy with scenes in the market, the children’s parody of the changing of the guards, the passionate singing and dancing in the cafe, the appearance of Escamillo, the toreador with his groupies and photographers, and the spectacle of the bullfight. This heightened sense of energy served to make the tragic events even more gripping. Carmen, the central figure in the opera is a complicated character. She is a free-spirited ‘gypsy’ who can seduce any man she wishes, and at the same time, has an unbendable will. She is willing to face death rather than compromise her passionate desires. But in the end, death is her fate. Rachvelishvili was powerful in her portrayal of stubborn determination in order to avoid Don José’s relentless efforts to control her. Her singing was powerful and convincing. Carmen’s spirited arias in the first two acts are well known. It was in the last two acts where Carmen’s darker side was exposed that Rachvelishvili shone. Thomas was remarkable in his role as Don José. His duet ‘Parle-moi de ma mѐre’ with Micaëla, played by Simone Osborne, in the first act, was a truly memorable moment. They convincingly portrayed an innocent inhibited couple. Osborne gave a strong performance illuminating her beautiful soprano voice. Don José was subsequently seduced by Carmen only to become obsessive to the point of committing murder. The Canadian Children’s Opera Company was a special highlight of the evening. They acted and sang with creativity, energy and conviction. Carmen continues its run at The Four Seasons Centre until May 15th alternating with Rossini’s Maometto II. Thanks so much for your kind words about the kids! If possible, can you amend “COC Children’s Choir” to “Canadian Children’s Opera Company?” Thanks.